Toyota strengthening segment 4 × 4 double cabin with the launch of New Hilux D-cab V A/T. The car is expected to address customer needs in the personal category would double cabin vehicle transmission type A/T with exterior and interior features of the more charming. This new variant complete product line up Hilux D-cab Toyota which has been marketed before, the New Hilux D-cab 2.5 Diesel E M/T and New Hilux D-cab 2.5 Diesel G M/T. President Director of PT Toyota Astra Motor, Johnny Darmawan, said the current class of pickup 4 × 4 D-cab V A/T in Indonesia shows an interesting trend. "D-cab has created its own class and segments for his ability as a suitable utility vehicles in all fields, and able to present the impression dashing and sporty as private vehicles," said Johnny. With the presence of New Hilux D-cab V A/T, Toyota hopes to accommodate the needs of customers who want a double cabin vehicles are comfortable, stylish, and trendy, but still carry the toughness. Display New Hilux D-cab VA / T is designed more stylish than the mounts that used to exist in the area of ​​mining and plantation. Features exterior and interior is more captivating is expected to meet the needs of customers in the personal category. A number of value added at D-cab Toyota's latest include steering switches are equipped with audio and MID (Multi Information Display) which is the first in a double cabin vehicle in Indonesia, leather seat material, 6 way driver seat adjustment powerseat and wheels 17 inch size. New Hilux D-cab V A/T is available in eight colors, ie; Super White II, Silver Metallic, Silky Gold Mica Metallic, Dark Steel Mica, Black Mica, Dark Grey Mica Metallic, Blue Metallic, and Super Red II. There are two transmission options, the 5-speed manual and 4-speed automatic. Throughout January to July 2012, Toyota's commercial vehicle segment posted encouraging results. One contributor to sales in this segment, the Hilux, had total sales of 7.233 units. 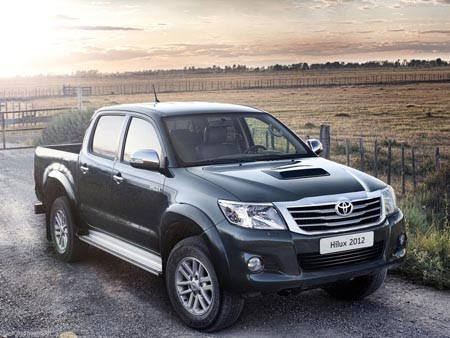 For the category of single cab, Hilux total sales during the first seven months of this year is 3828 units. Meanwhile, in the same period Hilux D-Cab recorded total sales of 3.405 units.